There are so many things to do in Georgetown that we did not do. Looking back on our days there, I can see why they call it Chicken Harbour. People come to GT and get caught up in the life and never move on! But it isn’t always because they are chicken… it’s because there are just so many things to do! We just never got around to attending the more social events. Suddenly with the moderation of the weather… it was time to go. We were very nearly convinced to stay on a while. The “season” is just beginning to get geared up. The morning net promised several intriguing gatherings in the coming days… a big party at the Flip-Flop Shack, an informative seminar on making your conch shell into a horn… Rake & Scrapes we never attended… Where does the time go? We had a couple of days of really windy weather. The forecast had been for winds in the 30-knot range, but we never really saw that other than a few gusts. The squalls never found us although the skies remained cloudy and ominous. Temperatures plummeted into the 60s and although I was forced to get out my favorite lap throw and snuggle up with the cat… I swear that I was feeling truly sorry for the folks back in the US who were experiencing things like blizzards and record low temperatures with a few tornados and ice storms thrown in for good measure. Our Bahamian “snow days” were long, welcome stretches of forced inactivity. The only frustration was that they kept our friends on Encore pinned down as well, and unable to travel those last few miles to GT. Finally the perfect weather window materialized to allow Jerry and Sally to make their way here. They joined us at Redshanks just in time to be whisked off to a party on the beach! Redshanks is kind of a little community within the larger whole of Elizabeth Harbour. It is further away from town and from the active social scene… so we have to make our own fun. A beach bonfire is a great way to get to know your new neighbors! People brought food to share and some cooked their meat on the open fire. 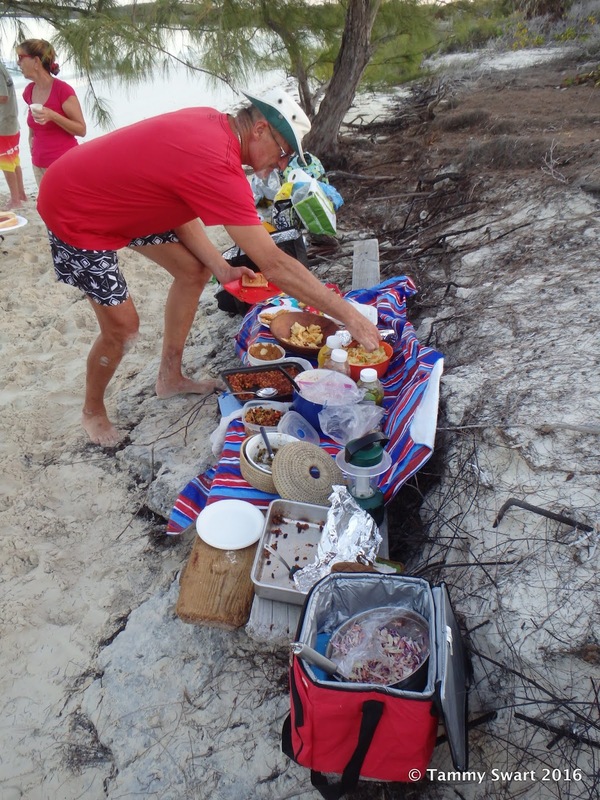 We cooked ours on the boat and so arrived a little late with the party already in full swing. Cruiser Pot Lucks are the best! People bring their favorite specialty dish and we get to try new things. There’s always a great variety of dishes…it’s almost like a competition. Bruce made his Mom’s-recipe-baked-beans and they disappeared! We met people from several of the other boats in this more intimate setting. Sometimes the vast numbers of boats in the harbour tend to discourage meeting others… there are just SO MANY of them. But this smaller gathering is just right for meeting and greeting. Having Jerry around is an awesome icebreaker… He’s never met a stranger and picks up lifelong friends as if they were pieces of sea-glass on the beach… Bruce and I just sit back and watch… happy to be along for the ride! We made several dinghy runs to town during our stay at Redshanks. Even with it being very windy, our route along the shores and in between the many small cays was relatively flat in comparison to how it was out in the Harbour. There is the most amazing bridge (by Bahamian standards) connecting Great Exuma to Crab Cay. Like many other projects in the Bahamas, the one on Crab Cay started with so much promise, only to end leaving partially built facilities to slowly fall to ruin. I wonder how long this bridge will remain passable before nature reclaims the space. One day we took our dinghies over to the small “town” adjacent to the anchorage… I’m not sure if THIS is the actual Redshanks… or not. But we found Brown’s Marina to be an interesting diversion. They are more geared toward services for fishing boats, their marina being very shallow and tight… but their marine supply store was stocked will all manner of goodies that we could use. We fueled up our gas tanks for the generator and left there in search of the Laundromat further up the shore. We parked our dinghies at a local restaurant that is advertised often on the morning net… Cheaters. I thought I had heard the name incorrectly but no… it’s really Cheaters. It was a splashy ride back to the boat! We stopped in for a long lunch and to use their wi-fi, and before we realized it, the afternoon was almost gone. No time to do laundry before our guests were due to arrive back on the boat. We had invited the crews of Seraide and Wright Away for happy hour! And what fun we had laughing and comparing stories. We celebrated the arrival of Encore in proper fashion with champagne toasts! Cruisers are always happy to celebrate… well… anything! Congratulations Encore - on your Gulf Stream Crossing! The weather turned fine with light winds for a day and no horrors in the near future. With Encore following, we left our cozy spot at Redshanks and ventured back out into Elizabeth Harbour to our favorite spot at Sand Dollar Beach. Into every Cruiser’s Life… a little (a lot) of work must come. 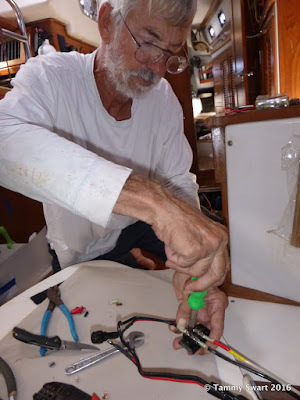 Our plans to become a “sponsoring vessel” for Chris Parker’s weather routing service have us scrambling to make sure that our SSB radio is in good working order. There have been some doubts about our ability to transmit properly and after Anthony from Magnolia came over and gave us some pointers about possible ways to increase our transmission power… we got to work on one of his two suggestions. We need to change out the 10-gage wire that brings power from our batteries to the radio with larger 8-gage wire. After marking it and taping the hot and ground wires together, we routed them beneath the floor. It was about ten feet from battery to radio but we followed the existing wire (you can see it there, it’s red with a black stripe) so it was pretty straightforward. We crimped connectors onto the ends and included an in-line 30 amp fuse on the hot wire near the battery. Instead of splicing the new wire to the one coming out of the radio we used a buss strip and taped it all up really nicely to protect the connections from contact or corrosion. When we connected it all to the battery it actually worked!!! Well, there is a little bit of corrosion causing the speaker wire to cut out, but after cleaning it and applying some dielectric grease, we’ve got that working again as well. We were proud of ourselves and feeling great about one more job ticked off the list just in time for a Sundowner! Weather allowed us one more day at the Sand Dollar beach anchorage before we would shuffle back to the “town side”… we took full advantage and went exploring with Jerry and Sally. There are trails all over the place and we even have a map showing them all… But they are still well hidden and it’s tricky to find them. Jerry found one just up from where we beached the dinghy and so the four of us traipsed off into the bushes in search of adventure. The path was well cleared, with one steep climb aided by a rope for pulling oneself up the smooth rock. Thanks to the Cruisers who have kept these trails so nicely for us all to enjoy! The path led first to a secluded little stretch of beach nestled between the hills. There were rocks breaking the wave action and had it been a wee bit warmer, we would have sat in the calm pools and enjoyed a saltwater bath… but it was still a little too cool for swimming. We combed the beach for possible sea-glass sightings, and then left with none to press on. The trail climbed higher and we were happy for the effort. Long days on the boat leave us wishing for some physical activity and this is just perfect… exercise with a purpose! Stunning views await the intrepid traveler… The trail reached the highest point and led us along the ridge of a cliff. Down below, the long waves would rise slowly and build until they would tumble onto the rocky shore below. The colors of the water are as ever, indescribably beautiful. Back at our respective boats, we pulled up anchors and shuffled back to town. Another weather “event” was forecast in which there would be a strong westerly component… Being close to Exuma kept the waves to a minimum and also made the trip to town in the dinghy very short. We downloaded weather emails and found that Chris Parker had been a bit vague about the forecast but we would listen again in the morning and maybe our plans would firm up. We were ready to leave our home of almost a month. So many things left un-done… We will be back someday.